An EBF Maiden Stakes over 7f on good to firm ground. This looks a battle between the two. I like Medicoe here. Although not much of a price he should take some beating. Sir Mark Prescott has taken his time with this son of Medicean who will go well on this turning course. This home bred, a chestnut gelding & January foal, was fancied on debut, which is often a telling pointer to this yard's better juveniles. Connections must have hoped for more on debut but a wide draw, insufficient trip & inexperience found him out. His breeding suggests a stiff test of stamina would be ideal, so it was surprising to see him dropped to the minimum trip when competing at Yarmouth second start. After being outpaced, Medicoe ran on with purpose, making ground on the winner who is no slouch. That was a respectable performance considering. Next start saw a return to 6f at York, which is a sharp track. Although an auction event the prize money was respectable and that was a good race for the grade. Luke Morris gave his mount a professional ride and for much of the race he looked to hold every chance. The winner and second are decent juveniles but what bolstered his form was beating two fair yardsticks in Ajmany & Bachotheque. The key to this juvenile's improvement is this step up to 7f. This will be the making of this horse and I would be surprised if he is beaten. Mark Johnston's stable have been in supreme form over the last week and Excellent Mariner has been fancied on both starts to date. This daughter of Henrythenavigator comes from a good family and she looks a battling type. She showed signs of inexperience on debut although not beaten far. She then looked to have the upper hand over Linguine at Beverley only to be worn down in the closing stages. It will be interesting if Johnston decided to send her to the front on this turning course. This bay filly has form over this trip and connections will have her primed today, ironing out those signs of inexperience which have been costly so far. This looks a fascinating duel and a tough challenge for both horses. Although hampered when racing against Excellent Mariner at Musselburgh, Chant looks to be held. Of the others, Ollie Pears fields three juveniles: two who have run in plating class and the other outpointed at auction level. All need to progress to pose a major threat. Juana Belen ran over course and distance on debut when a hot favourite for a lowly selling race. Barron's youngster was clearly placed to win and that is her grade. This will be a test and I would favour others. 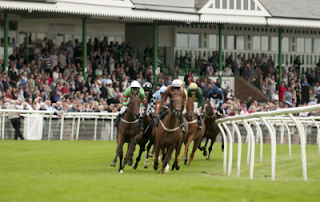 It is worth keeping an eye on the betting for Star Request trained by Keith Dalgleish. She was an outsider at Redcar over 6f and showed a glimmer of ability although the race was moderate. If substantially backed it would bring further confidence. Conclusion: I wouldn't look beyond the two favourites and side with Medicoe. This step up to 7f is ideal and considering he has shown ample ability over lesser distances speaks well in this weak race. It is a slight negative that Sir Mark Prescott has a poor strike rate at this course with his two-year-olds but that wouldn't temper my enthusiasm. Excellent Mariner is a determined filly. Connections will consider this to be a great opportunity and with the stable hitting a purple patch it would be wise to respect this juvenile. I can see a bold front-running performance but expect Medicoe to have the edge at the line. Not best drawn but a low weight for Modern Lady who showed a glimmer of ability last time at Thirsk. Guest is a canny trainer and this is a good, strong filly who is better than we have seen. This could be her day to shine. Moviesta is held in some regard by the stable and ran a fair debut at Pontefract when wide drawn, and running on the extreme for most before putting down a late challenge. He was ridden as though fit but that experience will give greater hope. Probably priced to chance. Would have been an HCE Gold Tip if an each way price. Veturia ran well on debut when competing at stakes class. This step up to 7f should not pose a problem and in a race which may not have much strength beyond the favourite and must have place claims at least.